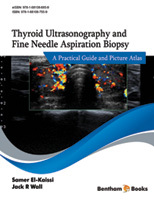 UG-FNA biopsy of the thyroid and CLNs is a safe and inexpensive procedure that can be performed in the office. Complications such as hematoma and severe pain are uncommon and the procedure provides a greater yield and is more accurate than FNA by palpation. A baseline thyroid ultrasound is essential for determining which nodules and/or CLNs require FNA biopsy and for selecting an entry path. The needle path is either parallel or perpendicular to the ultrasound beam, where the parallel path requires more practice but may be safer as it allows visualization of the biopsy needle throughout the procedure. Negative pressure ‘aspiration’ or capillary action biopsies are equally effective and a 25-27G needle is usually sufficient for solid nodules, whereas a larger gauge needle may be required for the aspiration of cystic content. The risk of a hematoma post-FNA biopsy is very low although it is important to minimize the number of FNA passes, apply gentle compression at the biopsy site after each pass, and to perform a brief ultrasound scan of the biopsy site at the end of the procedure. It is unclear if holding anti-thrombotic agents before the procedure is beneficial but it is important to ensure that in patients taking warfarin the international normalized ratio (INR) is less than 2.5-3.0 before the procedure. In addition to cytopathology, FNA biopsy allows measurement of tumour markers such as thyroglobulin and calcitonin when clinically indicated. The Bethesda system and the UK Royal College of Pathologists grading system are commonly used for reporting thyroid cytopathology.